Mouth ulcers, also known as canker sores, regularly affect around 20% of the population. Most people will experience at least one during their lifetime. Although mouth ulcers are not contagious and usually clear up in a few days, they can be extremely painful because they expose sensitive nerve endings, making drinking, eating and even talking uncomfortable. For some people the pain is so severe they cannot sleep. Mouth ulcers can happen at any time, although they are more common when one is run down, busy – for example during exams, deadlines and end-of-year pressures. Recurring mouth ulcers most commonly start during adolescence (between 10 and 20 years old). Fluctuating hormone levels can be a trigger – women are more likely than men to experience ulcers. Ulcers can occur when premenstrual, tired, pregnant or menopausal. Genetics seem to play a role – if your parents have had recurring mouth ulcers then there is a 90% chance you will too. Eat plain food and drinks, avoiding spices and salt or acidic drinks like orange juice that might burn. Drinking with a straw to bypass ulcers in the front of the mouth will help, but be careful that the drink is not hot enough to burn the throat. Avoid alcohol and tobacco, both of which can dry out and irritate the lining of the mouth. 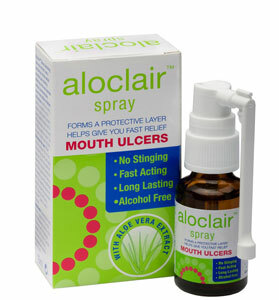 Use Aloclair for immediate relief. Don’t neglect your oral hygiene if you are experiencing mouth ulcers or a sore mouth. Rinse your mouth with salt water, Olgani or an anti-bacterial mouthwash such as GUM Paroex after eating and before going to bed – these will prevent the ulcer becoming infected and promote quicker healing. Continue to brush your teeth correctly twice a day – use a soft-bristled or child’s toothbrush. If your toothpaste stings, try using a non-foaming paste like GUM Paroex Gel toothpaste . Most mouth ulcers will last around 10 days before clearing up naturally. If an ulcer does not heal within two to three weeks, consult your doctor or dentist. Oral cancer rates are on the rise globally and are predicted to treble in the next generation. An ulcer can be an early indicator of oral cancer so it’s important to rule this out. Mouth Ulcers? 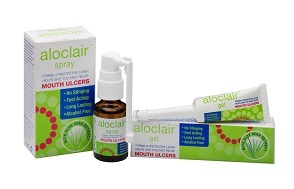 Would you like a free Aloclair sample to try? Please specify what sample you want to try and send a request to info@ivohealth.co.za and we will be in touch with you.